Have you ever had anyone ask you why you are tired but you’re not? Do you notice a depression and hollow area under the eyes that you try to conceal? This is a common concern and we have solutions that can improve the under eye area. The first thing is to evaluate if you have darkness alone without a true depression. Some people have a darkness that makes it look like there is a depression but there isn’t. The dark shadow makes the area look hollow. If you put concealer on the under eye area and are happy with those results, most likely you don’t have a depression. The depression is often noticeable because of bulging of the fat pads under the eyes. The fat pads are higher than the surrounding tissue and then drop off, creating a depression. In contrast, some people don’t have bulging fat pads, they just have no fat in the area and it creates thin skin and no volume which makes a depression in the under eye area. In either case, the solution to these are most likely to add volume to blend the area and smooth the skin. Adding dermal fillers like Restylane to the under eye area can rejuvenate and enhance the eyes. Most clients notice an improvement in their darkness under the eyes after filler is used. Fillers results in the under eye area (tear trough) can last up to two years. In addition to dermal fillers, we have other options like lasers, Exilis Ultra and chemical peels to enhance the eye area. 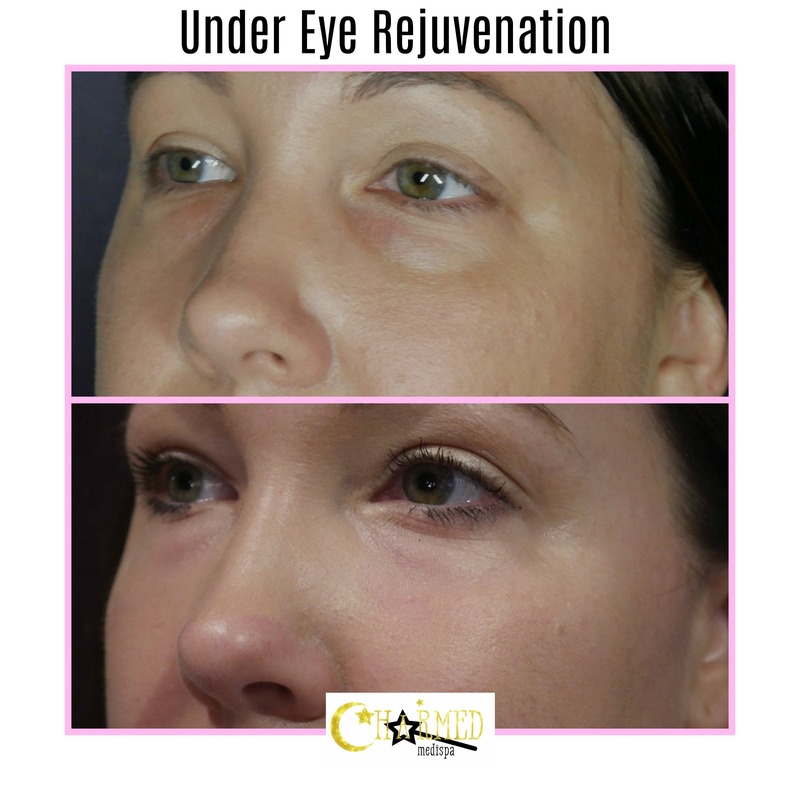 Our med spa can walk you through the process and determine if you are a good candidate for under eye rejuvenation. Charmed Medispa’s focus is on delivering a compelling result that makes you feel refreshed. Our med spa in Delaware also offers Botox, microdermabrasions, microneedling and anti-aging solutions. If you are looking for a med spa near you that has an exceptional reputation, five star reviews and a portfolio of beautiful before and afters, look no further.